“While the companion’s dread was reflected in the stones a way opened. The streaming water formed an ocean that crystallized the light from the incantations and spells of our guide. They discovered the cult that was upsetting the place and that was abandoning itself in despicable rituals from the depths of time.” That is exactly what this album deals with, like an introduction of an illustrious journey through ancient Mesopotamian mysteries, myths and occult rituals, an esoteric trip towards a forgotten cave of metaphysical darkness and lights. 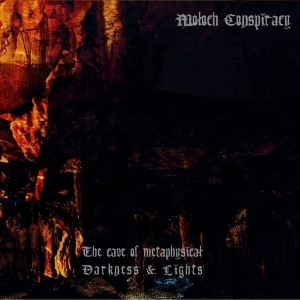 The Cave Of Metaphysical Darkness & Lights is the second Moloch Conspiracy album, after 2017’s The Burned Temple. It is an extremely limited release, available via Eighth Tower Records (offering its audience superspectrum sounds from ultraterrestrian dimensions), the upcoming and promising label from Sonologyst mastermind Raffaele Pezzella. The album consists of seven organically related compositions, having a total running time of about fifty minutes. It was written, recorded, produced and mixed completely by sole member Julien A. Lacroix, who also performs under his own name, and who recently formed α Ori too. With The Cave Of Metaphysical Darkness & Lights, Moloch Conspiracy offers us a mixture of the darker sides of Drone, Ambient and the likes. it is an obscure cinematic experience with a horrific (I almost wanted to add: ‘Lovecraftian’) atmosphere. Hypnotic incantations based on ambient soundscapes, injected by different field recordings / found sounds, at the one hand, and grim elegies with a ritual and esoteric character at the other hand, are molten into droning compositions that touch the deepest and darkest Inner Eye. It delves into the abyssal mystical darkness of the past, yet at the same time I feel an astral and unphysical vastness as well, like a cosmic journey through untrodden and unexplored dimensions beyond time and space. Moloch Conspiracy make use of synths, samples (some sounds were recorded at forts near Verdun during WW I) and natural field recordings, as well as piano, vocal appearances, cello, gusle (a Folk Music used ethnic string instrument, like a single-stringed violin, from the Balkan area), timpani or duduk (a wooden wind instrument, originating from the Caucasus). The result is like a mixture of both digital and acoustic material, canalised into one organically processed result. Opener At The Entrance To The Cave is based on bass-synth drones, cavernous keyboard layers and several additional sounds (choir-like chants, percussive details, elements of Nature). It’s mysterious, ominous and, at the same time, little adventurous, for you do not know what would lie beneath this passage towards the mythical past. Quite comparable is Fear Of Stones, with its floating waves of industrialised Aural Art. Scarifying, ‘empty’ moments interact organically with full, bombastic passages. However, it is little more intense and dynamic than the opener, and so we’re sure the bold venture goes on. Kulullû continues the very same path, but it climbs up towards an extremely mesmerizing and ominous level. Piano, duduk, strings (cello, I think) and different percussions are used in addition to the eerie synths, resulting in an asphyxiating, immersive result. It’s unusual, somewhat experimental, yet it draws, and keeps, your attention for sure. In the very same way of astonishment, Apsû continues this weird trend while adding those strange, bewitching, dark fairylike semi-whispered voice of Uunslit. Like the digital voice of Meiko is several Cryostasium recordings, it is a hypnotic experience, charming and enchanting. And yes, it does fit to this strange composition, with its expended amalgam of instrumentation and sounds. More cinematic is The Subterranean River (don’t go swim in it…), which includes spoken (male) words, many sampled additions, and suppressing and ominous synth lines, resulting in a suffocative sonic definition of ritual glamour and fascination. The Awful Ritual has a meditative edge, probably because of the bells, hidden voices and choirs and droning basses, and it might be the most heavy, spiritual and mesmerizing piece on the album. It is such a bleak, murky and opaque creation, this song, accompanying the listener to ceremonies of death and resurrection. Blood-soaked rituals in an abyssal torch-lit cave, offerings to forbidden gods, it’s all grasped in this dim track, which was destructed and reconstructed by Nico ‘Niculta’ Döring. The album ends with Epilogue, which includes ethereal piano tingling and bleak soundwaves, carrying a heavy, smothering atmosphere and, at the same time, offering an enlightening visionary chimera. The Cave Of Metaphysical Darkness & Lights has a lot to offer, and in an open-minded way it is both menacing and revealing. An hour is a long time, and this needs persuasion and endurance, but as result you might crave for more. Julien A. Lacroix created something quite unique right here. ‘While the stones reflected the terror of the companions, a passage opened. The streaming water formed an ocean which crystallized the light of our guide’s spells. They discovered the sect that had angered this place by having indulged in odious rituals from the ancient time’.